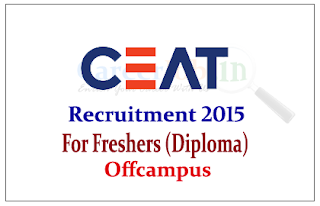 CEAT tyres is recruiting freshers for diploma candidates offcampus drive will be held at Pune for the year of 2015. Eligible candidate can apply here on or before 15th June 2015. CEAT, the flagship company of RPG Enterprises, was established in 1958. Its predecessor Cavi Electrici e Affini Torino SpA was established in Italy in 1924. Eligible Candidates can apply online on or before 15.06.2015, for more details check official Notification.